Today I am sharing the next installment of setting up your home management binder. So far we have talked about what supplies you need to set up your binder, as well as the planning and contact sections. Now we will talk about the ‘Children’ and ‘Family’ sections. I will be sharing some additional free printables with you as well. The ‘Children’ section is one I use the most, especially now that my son has started participating in sports and is attending school. If you don’t have children yet, you may want to include a place for your pets or you can omit this section all together. Pretty much everything that has to do with my kids goes in this section. First, I have information sheets for both of my children. I try to update these each time my child has their yearly well check exam and once again about 6 months later. This way I can update a current weight and height for each child. This helps for when we need to administer medication to them. (It is best to medicate by weight rather than age.) If you have a child under 2 you may need to update this information more frequently as their weight and height changes more often. 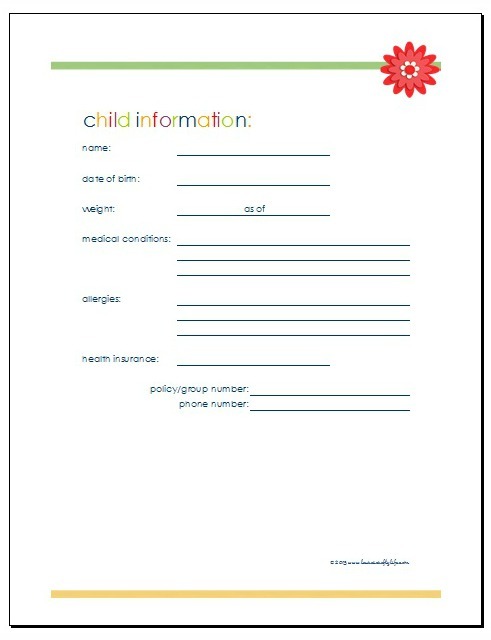 The sheet also includes allergy and insurance information for each child. This is a great reference sheet for caretakers as well. Next in my binder I include a sheet I received from my doctor with dosing instructions for different types of medication. I keep it in a page protector right behind the the kid’s general information. You can fill in information for up to three children. You can include what foods they are allowed to have, when they should have a nap or go to bed, what discipline technique your babysitter should use (time out, loss of privileges, etc. ), as well as all the information for where you are going and when you will be home. I included a place for your home address and phone number. This can be valuable information your babysitter may not know in case of any emergency and needing to call for help. Next, is school paperwork that I need to refer back to, such as the school handbook, and information sent home for parents goes here. I do not include any of my son’s school work that he brings home. That has a whole other storage solution I hope to share with you soon. I have this section marked with a removable tab so I can easily reference all the information. One thing I wanted to mention about setting up your binder is if you use dividers that also include a folder (instead of just plain ones), is you can use that folder to temporarily hold information until you hole punch it and put it in the binder. I also put permission slips or anything else that may need to be signed or returned to school that I do not immediately put in his folder to go back the next day. I also include any sports information. Usually there is a lot of paper work whenever a new season starts. The printable calendar goes in the front ‘calendar’ section, but uniform information, picture forms and any other information involving sports goes here. I keep the information until the season is over and then I will remove it and either permanently file it or throw it out. The family section holds more general family information (not specific to the children). I have library information, print out of maps of parks in our area, and brochures I may pick up that may be something for us to do. Is there anything else you include in your family or children sections of your home management binders?